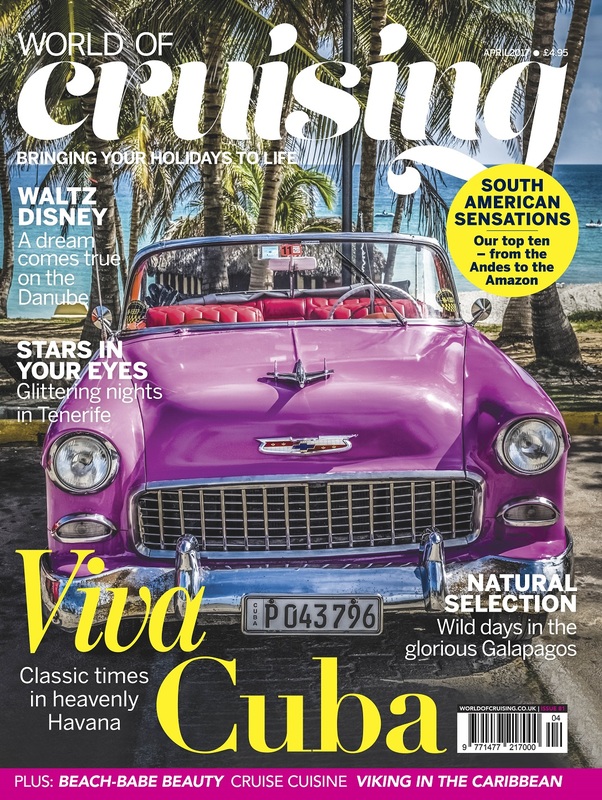 Welcome aboard your April issue of World of Cruising! IS THAT A SWIFT or a swallow outside my window? Ornithology is not my strong point but spring is definitely springing, and here at World of Cruising the spectacular wildlife has already arrived (see our report from the Galapagos on page 48). That extra hour gives us all more time to daydream about our next cruise, and this issue is packed with great ideas. Fancy Havana good time (sorry!) in Cuba? Look no further than page 32. We’ve also picked our top ten amazing ways to discover South America, and we’ve cruised the Caribbean – Scandi-style – with Viking. Multi-generational cruises are big news these days, and if you turn to page 40 you can read how one grandma-and-granddaughter duo made their dreams come true on the Danube… with a little help from Mr Disney. Meanwhile here in the office we’re still recovering from an amazing night at the Wave Awards (see page 106). Can’t wait to do it all again next year!